Prints made with the highest quality. experience in the photo industry. Whether you’re looking for the best online photo printing, custom photo canvas prints, a unique gift or you simply want to celebrate life’s best moments; RitzPix has a variety of personalized products, prints, enlargements, photo albums and more to highlight your best pictures. Easily place your order and choose from hundreds of custom options to express your personality with your own photo creations. 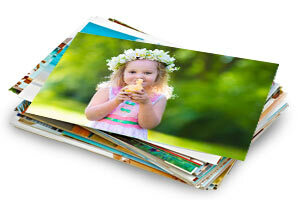 RitzPix offers the cheapest photo prints online! Far too many photos remain hidden on our smart phones, hard drives and tablets. Why not print them out for future generations and add them to your family photo album or favorite scrapbook. We have all the classic sizes ranging from 4×6 photo prints to the versatile 8×10 photo size which is ideal for framing or adding to your memory book. 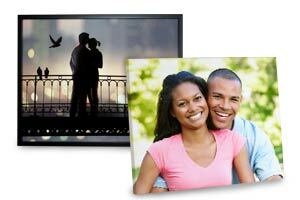 Print matte photos or glossy photo prints for any photo printing project. We offer the best online photo printing to fulfill all your needs! If you really want to make a statement with your photos, our poster printing option is the way to go. 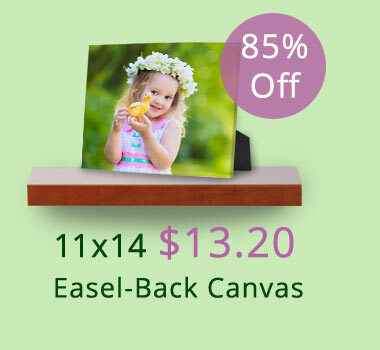 From 11×14 photo enlargements to 24×36 poster prints, we have a variety of sizes that are perfect for framing. There’s no better way to add interest to your wall décor than by incorporating a treasured moment. Frame a fun, candid snapshot of the kids with the family dog or hang a large poster print of your favorite landscape photo in your living room to brighten your home. Make a poster from a picture online in just a few easy steps and enjoy your photos the way they were meant to be, each day! The best canvas prints are the ones that showcase one of your own photos. We have a large variety of options including gallery wrapped and framed so you can showcase your prized moments on canvas prints cheap, without sacrificing quality. Give your wall art collection at home a sophisticated update and print canvas photos with rich colors and contrasts. Photo canvas prints look amazing anywhere, whether you’ve created a stunning panoramic canvas to hang over your mantle or a little easel back print to decorate your bedroom side table. Choose a canvas size depending on the room in which you want it displayed and then select your photo to get your order started. Make your own canvas print in a matter of minutes by simply uploading your favorite photo. High quality wall décor has never been this simple! Add character, color and personality to your home with our photo wall décor collection. In addition to gallery wrapped canvas prints, we also offer several unique ways of highlighting your most cherished memories. Give your wall art a fun, new addition with one of our many custom photo art products that showcase any photo to their full potential. If you prefer simple, modern design, how about our metal prints? Printed on durable aluminum, our metal panel photo prints appear to float on your wall giving them a stunning, elegant look. Additionally, our photo panel prints also make a great addition to any décor. We also have an array of other options for dressing up your home with memories. Go big or go small. No matter the wall art you choose, its sure to express your personality and brighten your day. Maybe you’re looking for something a little less permanent instead. We also have an array of custom banner and banner printing options for parties, galas, weddings, businesses and trade shows. From classic vinyl banners to paper party banners, you can create your own with photos, text and an array of templates to suit any occasion. Maybe you have a whole library of photos on your phone from the past year that you’ve been meaning to print. Some of them could be your holiday photos, some snapshots from your summer vacation and your kids’ school pictures. Make your own photo book and showcase your favorite memories together in one place. Our photo book maker lets you choose your own custom cover option and you can personalize each page with an array of imaginative photo arrangements and text to tell your story with photos. Our professional photo books are easy to create and are a great way to preserve your memories. Not only are they perfect for displaying a year’s worth of photos, you can design them with a whole catalogue of templates that are ideal for any occasion. Create your own wedding photo albums online or design an album of your graduation memories as a keepsake to look back on with family and friends. Custom photo books are a tried and true tradition that keeps your pictures safe for future generations. If you’ve been searching for a site for photo cards online, then look no further than RitzPix! 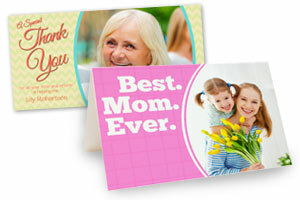 We have personalized greeting cards, custom announcements and photo invitations for every occasion. Whether you want to design holiday photo cards or create custom wedding invitations, you can add your favorite photos to add your own personal touch to any greeting throughout the year. We also offer several greeting card styles including classic glossy photo cards, card stock photo cards and traditional folding cards to suit your needs perfectly. Create graduation announcements with a senior photo or design a photo birthday invitation with a fun selfie to invite guests to your party in style. No matter the greeting, you can make it uniquely you at RitzPix.com! Create your own custom calendar template with photos and even add your own text! 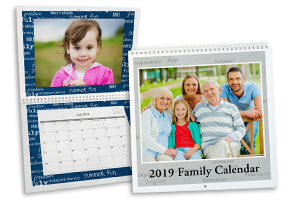 Our photo calendar maker is a fast and simple way to add a personal touch to your daily routine. Keep up with your daily appointments, loved one’s birthdays, holidays and your busy schedule while enjoying your treasured photos each day. We have several custom options to select from so you can create the ultimate wall calendar that not only keeps you up to date but also shows off your photos through the year. Custom wall calendars are a fun gift idea for the holidays or can be created any time of year to liven up your day. Last but not least, we offer several custom photo gifts that are perfect for anyone on your shopping list. Nothing is more personal than a photo, so why not create your own special keepsakes that celebrate your fondest remembrances. From custom photo blankets to personalized throw pillows, we have something for everyone. Upload your photos to RitzPix and let your creativity take the driver’s seat. 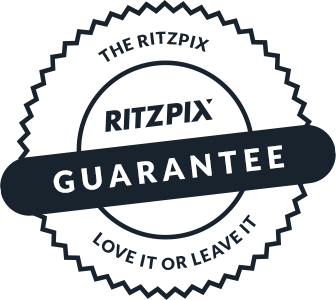 We have hundreds of design options to select from, so you’re guaranteed to make something that is uniquely you! Whether you’re looking to order classic prints or create an amazing gift using your own photos, RitzPix makes the process as easy as 1-2-3. Upload photos from your phone, tablet, or laptop and get creative. You can feature your wedding pictures, graduation photos, or random snapshots from the past year on our wide range of products. We have hundreds of custom options to select from, so you’re sure to design something you love whether it’s a practical kitchen accessory or a large canvas print for your living room wall. 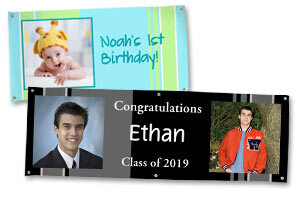 Incorporate your best photographic moments into your daily life with RitzPix custom online printing!